Karmakanic is Jonas Reingold's musical home, the place where he's responsible for everything and so Karmakanic is a more personal thing. In A Perfect World is the 4th album of Karmakanic and this time Mr. Reingold put as much effort into the lyrics as in the music - and so made it even stronger. The opener is called 1969, the year he was burn and so in a way the beginning of everything Jonas is. He stated that everything surrounding you influences you and so you'll find reminiscences from different genres and times in the new Karmakanic sound. The main theme of 1969 is repeated through out the song, but in different forms. With Göran Edman Jonas Reingold has a great vocalist in the band who easily adjusts to every mood, change of atmosphere. In a way even Göran Edman gets the chance to show more of his talent than on many other projects he's involved with. At 1969 Karmakanic combines 70's prog rock with art rock elements and some parts which are almost lounge jazz-like. Other passages are a bit bulky and need more then one spin to get into. After 1969, the longest track of In A Perfect World, they move on to Turn It Up, a song which is more straight forward. A pop rock tune spiced up with some retro prog sound and a soaring vocal line. But Marcus Liliequist's drumming isn't pop rock like and so adds a different flavor to the track. Again some Yes-like moments can be found here, but Jonas Reingold always said that in his music you'll find his influences easy to spot. While others copycat certain elements Reingold naturally seems to embed them in his compositions. At Turn It Up I hear a dash of Styx, a band I love, so no complains. The sound of surf in the distance and Göran Edman's expressive vocals lead you slowly into The World Is Caving In. Piano and keyboard join in. After almost 2 minutes the tune becomes a true prog rocker with heavy guitar riffs and catchy vocals. As it's one of the longer tunes you can expect some instrumental passages as well as twists and turns. Can't Take It With You is based on a Latin sound in the beginning and later returns to the Latin theme, but also offers some really heavy riffs, modern elements and varying vocals. Pushing limits with atonal vocal passages and some free jazz-inspired passages. For There's Nothing Wrong With The World they ease up and the opening passage is atmospheric vocals and keyboards. Then they go head into a prog rocker which shows reminiscences to Yes and a keyboard passage which is influenced by a classic compositions. With Bite The Grite Mr. Reingold offers a Beatles-que tune with heavy riffs and even symphonic sounds. 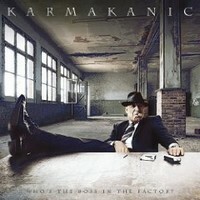 Karmakanic once more delivered a great prog rock album full of songs which are enchanting in different ways. Kudos! Karmakanic is more then a project, it's a band which Jonas Reingold started back in 1999. Whenever Jonas Reingold isn't working with The Flower Kings he's working on Karmakanic. With Who's The Boss In The Factory they present their 3rd album which kicks off with a short passage sung by Reingold's 5-year-old son. Then keyboard sounds come closer, drums and guitar join in and slowly the symphonic retro-prog rock tune develops. And they have time to, coz Send A Message From The Heart is just shy of 20 minutes! Göran Edman's vocals add a light note.. A bit AOR-ish and with a positive vibe. But twists and turns demand attention - and at some symphonic passage it reminds me a bit of ELP... But also when they head into complex progressive parts they are entertaining - and the Hammond organ played by Andy Tillison adds the retro touch. The 2nd tune is Let In Hollywood and acoustic guitar open it up. More rock with a light touch of the California sound. Sure, you find progressive elements and heavy riffs, crossing the borders with metallic riffs, but at the same time it has an airiness... Then it's time for the title track! Again they start slowly with keyboards and the unique voice of Göran Edman joins after a minute. The vocals are intense, but then the song atmosphere changes and the song becomes a happy rocker. They get heavy and a bit dark... The music gets a bit lighter, but the lyrics still have a dark touch. Again it's the twists and turns - Jonas Reingold just knows how to write good progressive rock songs! Even the jazzy piano part fits in. Really cool! At Two Blocks From The Edge they show another side of Karmakanic - and Theo Travis adds some cool saxophone part. A kind of pop / prog rocker with saxophone. At the end the five-some presents Eternally which is split into 2 parts and kicks off with the instrumental part. The instrumental part they keep short and lead over to part 2 which sticks out due to the accordion played by Lelo Nika. A very emotional tune which carries you away. The song is dedicated to Reingold's parents who died in a car crash just before Christmas. The stings and the vocals create a special atmosphere - and carry the sadness. And then the keyboard let the song, the album fade out. Again Jonas Reingold got a helping hand from some well-known musicians like his Flower Kings band mate Tomas Bodin and Andy Tillison (The Tangent). And I guess this is not the last time Karmakanic will surprise the fans with their music and some renowned musicians.